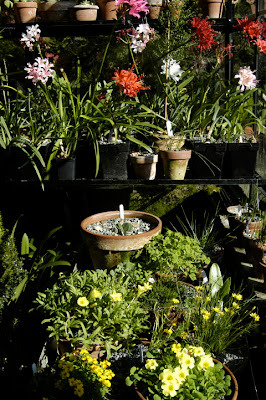 I am trying som elarger pots for some of thebigger, and more challenging S.A. bulbs, and this winter growing season, I am dedicating a raised plunge bench for some of them, pictured here, so that they can recieve the maximum amount of sunshine. Primarily winter growers in the southern hemisphere, I probobly should add some merciry lighting to lengthen the day, but I don't know of anyone else who has done that, and besides, the additional light would undoubtedly throw off the other day length-sensitive plants. For now, these Cyrtanthus, Velithimia, Boophane, Brunvigia and Nerine species will have to settle on our weak and meager offering of sunshine in New England, as winter begins. I am trying a few new species of Oxalis flava, there are so many forms available, this one still only produces a few single blossoms in the palest of pink, and I have yet to be able to distinguish between many of them - they all look like lupine-leaves to me! I am annually impressed with the blooming capacity of Oxalis luteola, one of the first bulbous Oxalis species that I acquired six years ago. It seems to like repotting, although, this year, I skipped repotting, and I am finding the there are indeed, fewer blooms. 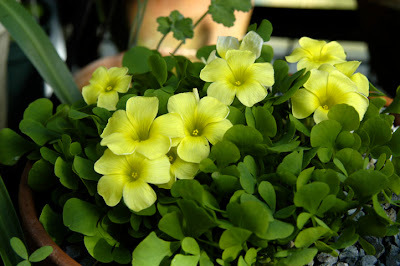 I like to repot most of my Oxalis in August, when they are dormant, and then retrive 'hidden- back-up" bulbs which the plants like to stuff, near the bottom of the pot. Presumable they act as a back-up to Baboons or other creatures who might dig the first layer, to eat. I then repot them densly, neck to neck, in the center of a bulb pan. Some oxalis species together in a raised plunge bench, along with some late Nerine sarniensis. I love watching the oxals open on a sunny day, (closed on overcast days). They can open in 10 minutes, and one can watch them as the morning sun heats the air up. 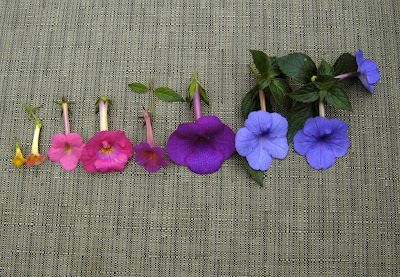 A line-up of Achimenes showing the variety and diversity between various species and named varietites available. Isn't it funny how even though one may be obsessive about collecting so many plants, there are still species out there that one can discover? 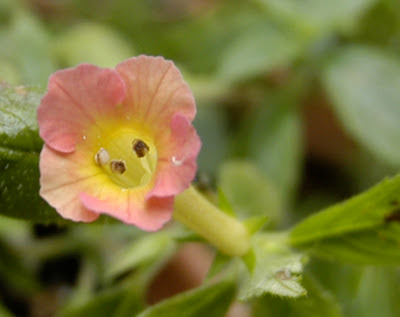 Although not "new" to me, since I remember seeing these African Violet relatives in the old 1960's Park seed company catalogs, often listed as Hot Water Plants (? ), I never mustered up courage to try them. 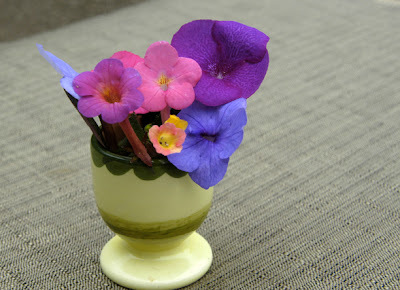 Achimenes blossoms in an egg cup. I suppose, they just seemed a little too unrealistic, I mean, come-on...."they'll cover themselves with flowers, and bloom till frost?"Rrrright. 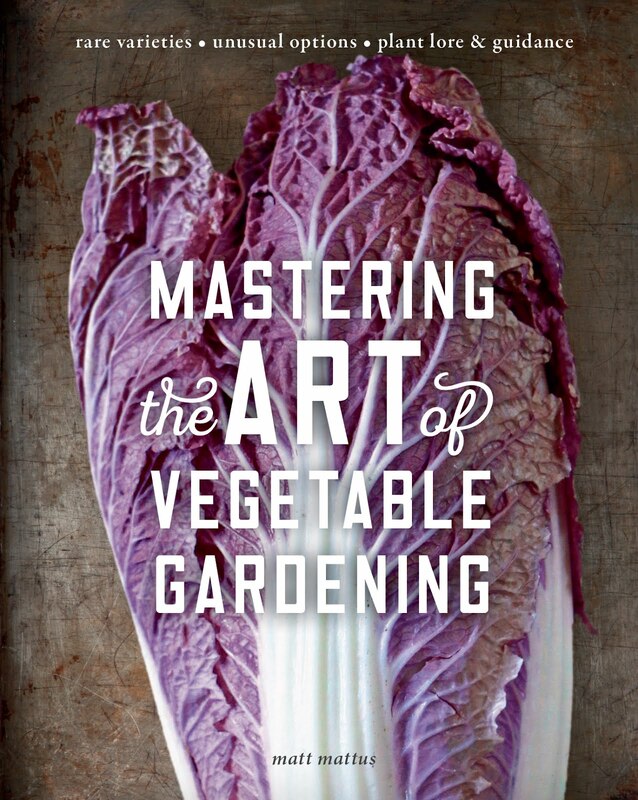 In those early years, as a kid, I preferred to invest in breeding the first white marigold! 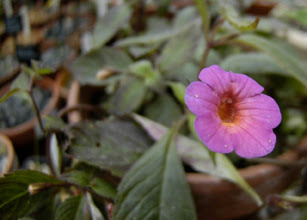 So, here I am, in my late forties, and finally growing these 'Achimenes'. Perhaps it is best that I waited. 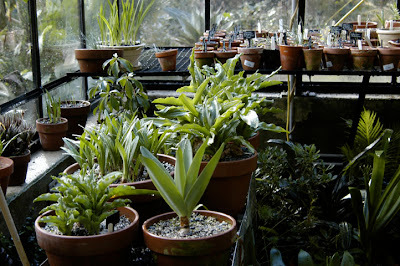 There surely is an argument for saving more challenging plants to try, until one is matured. 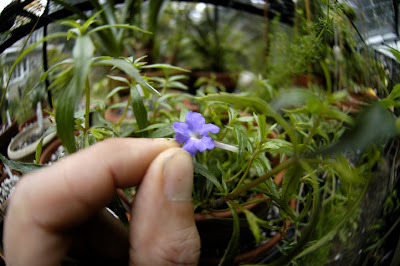 Hence, why most plant geeks mature-out with Alpines, or Gesneriads. 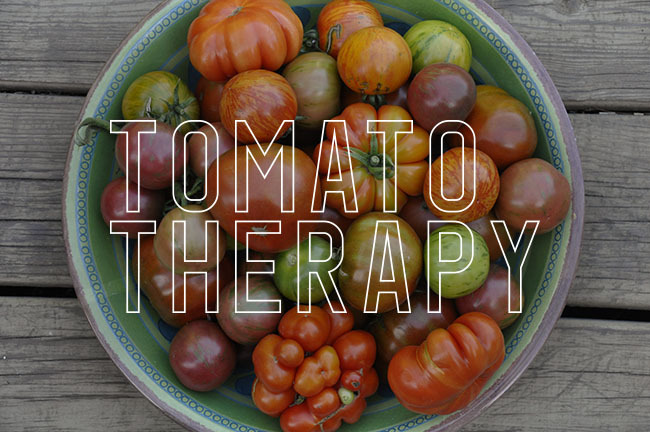 Just as others begin with Hosta or Daylillies. There must be some demographic studies out there. 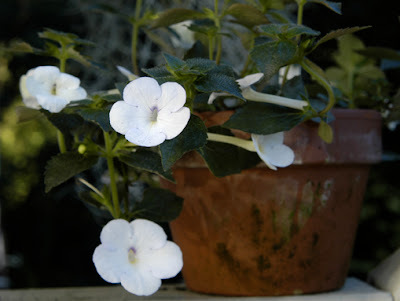 Achimenes display in the autumn greenhouse. 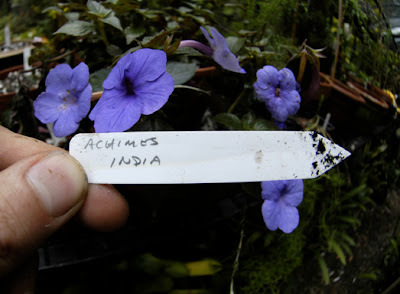 Not that Achimenes are difficult, although, they really don't 'cover themselves with blossoms, either". 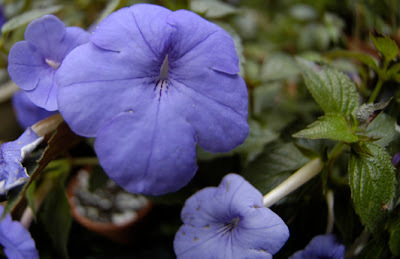 That said, they are easy enough to grow, and perhaps perfect for a covered porch or protected spot in the garden. 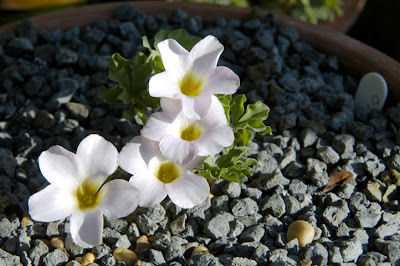 I ordered my rhizome in April from Kartuz Greenhouses, one must order them in early spring, while they are dormant. Shipping exists from February for those in the south, through to April in the north. On arrival, my 35 varieties and species all packaged neatly in paper bags with shavings, looked like tiny white maggots. Each rhizomes was planted in a 4" pot, and watered well. 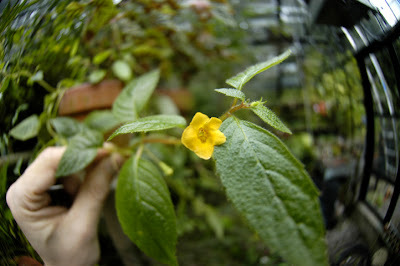 an novelty cross, very species-like in habit, it's exciting to breeders because it is a yellow and red color, but weak and virtually unknowticable. Easy enough to grow, the only hint I was given my friends, was to never let them dry out, or they risk going dormant again. Still, since these are fuzzy leaved African violet relatives, I knew that I needed to be careful about water on the foliage. 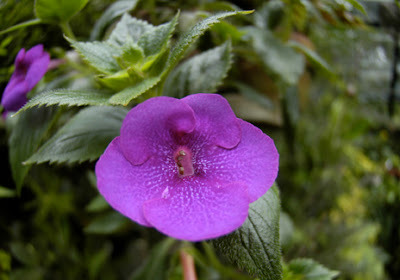 Although they can be grown outside, where of course, water will fall on the foliage, it will also air-dry off quickly. 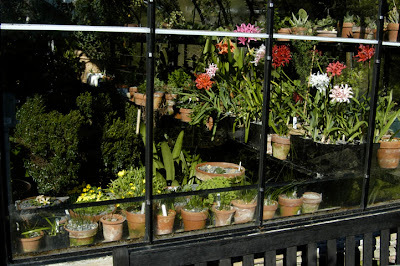 For me, I decided to keep them in the greenhouse, since although the water risked marking the foliage in the still atmosphere, I could at least travel, and know that they we're under shade cloth and watered well. The cost of a few marked leaves, was worth the flowers. Nice. A better name would be Jennier Best! 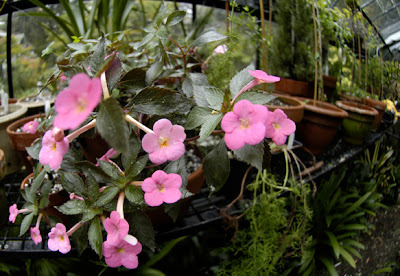 This is my first year really exploring gesneriads, all of the African violet relatives, and although not hooked yet, I have to admit that these Achimenes we're the least exciting of the lot, so far. 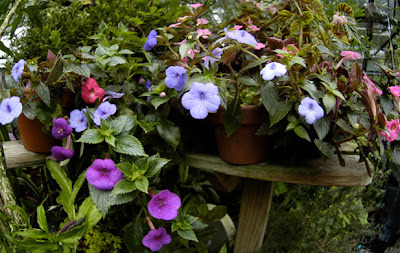 Most of the summer growing Gesneriads reach a peak bloom around autumn, and so it is with the Achimenes. Still, they are easy enough for me to dry off the pots , as I am now, for the winter, and perhaps when I repot and water them for a new season of bloom, the show might be better. 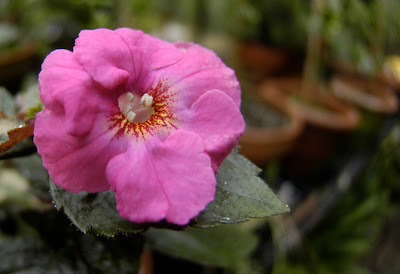 For that, I shall wait until next year, refocusing my Gesneriad addiction to Streptocarpus leaves on eBay. Although, not mine. Nice foliage though. A rare yellow species, it's a species, so I like this. But friends may call it a weed. A novelty, but nice to balance the context of a collection. A nice pot of early blooming white form, with a lost tag.